Home sweet home! My first thought for refreshment was my trusty Earl Grey tea, but of course I’ve covered this already. We arrived home this afternoon, went to the grocery store as we were out of everything, and I decided to get Will the ingredients for a root beer float. He’d tried one on our vacation and loved it. So, yes this day of the challenge was a set up, but it’s the end of a long day of traveling, and as you can see his enjoyment in this particular ‘refreshment’ is genuine. At 5:15pm it’s getting pretty dark in the house, so my ISO was set at 500, my shutter speed at 1/60, and my aperture at f/1.4. I focused on Will’s eyes, but I love that the reflection on the granite countertop is still in focus. Post-processing in Lightroom, the pendant lamp hanging above Will had given a color cast and also blown out some of the highlights on his hands and face. As the picture was a little dark, I increased the exposure a little but decreased the highlights and whites to compensate. I also decreased the temperature and increased the contrast and clarity. With four days in NYC, ‘refreshment’ was an easy challenge. We began our trip with New York pizza and ended it with Doughnut Plant. And in between, there were things like… frozen hot chocolate at Serendipity 3, crepes in Bryant Park, and turkey with all the fixings, along with foie de veau (calves’ liver) for Thanksgiving dinner. 😉 We took our French exchange student to our favorite French restaurant in Manhattan for Thanksgiving, and she grinned from ear to ear the entire time. French conversation with the owner and familiar foods, was just what she needed one week into her stay with us. All of these foods listed, and more, would have been perfect models for refreshment, but in the end, it was Baked by Melissa cupcakes that I chose to feature. If you have never been to this cupcakery, they offer flavors like Peanut Butter and Jelly, Chocolate Chip Pancake and Coffee Caramel. But what makes them so special, is that all of their cupcakes are mini. One bite. That’s all it takes. Absolutely delicious and dangerous. And I have never known anybody to eat just one! I took this photo at their Grand Central Station location. It was early evening, so although the front of the very tiny shop is all windows, there was no natural light shining in. 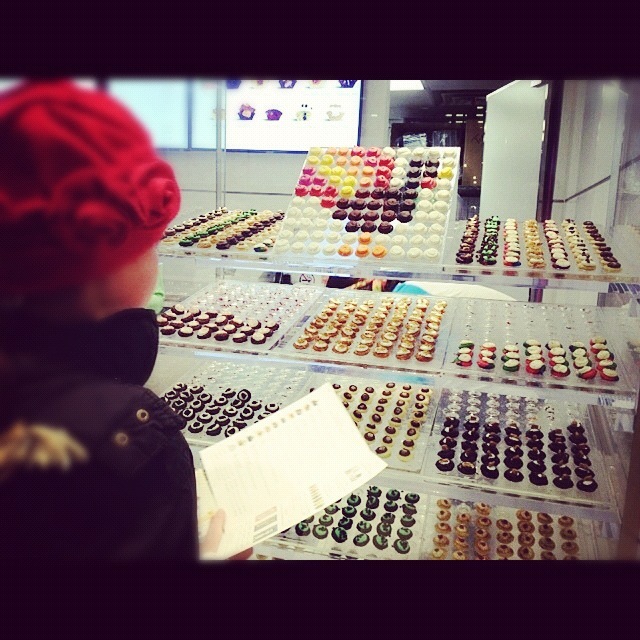 Chloe was very carefully selecting her favorite flavors for a box of 12, to bring home to her family in France. The rest of us were busy selecting our choice of three, and I admit, It took me less than three minutes to devour mine. I brightened and sharpened the pic in Snapseed and then used the Amaro effect in Instagram. Keeping with my traveling ways, I edited the photo in about the same time that it took me to devour my mini cupcakes. Quick and easy, and on the go! What a fantastic photo of “Alex”…(love the red hair & freckles!) along with my favorite–Root Beer float!! 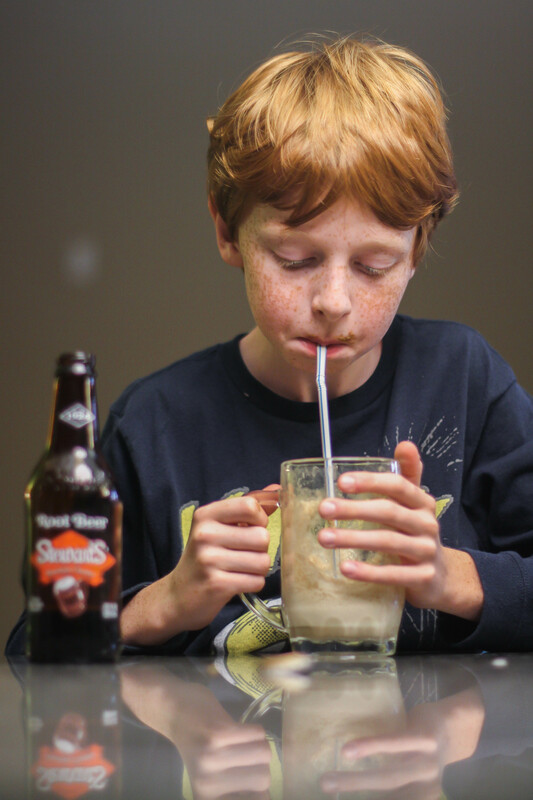 Hmmm root beer float…we love those! Ok B when I come visit, I want to go here for cupcakes!! Alex Will should be a pianist with those lovely long fingers! I love that half of it’s on his face haha. Looks very “refreshing”…good choice!